Old Rusty Ride Photo Picture Classic Cars for sale & Classifieds - Buy Sell Classic Car & Classic Truck Classifieds. 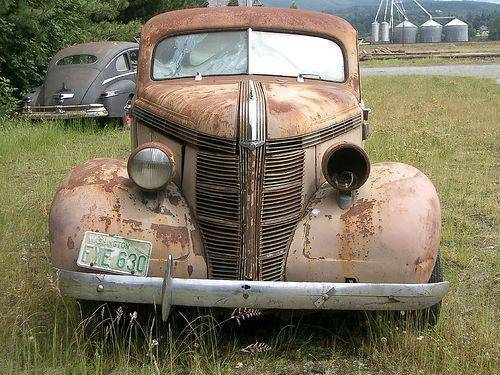 1937 Pontiac, guess it could be either flat head 6 or 8. The 8 hood is distinctively longer but can't tell in this photo! the black one does look like a ford but the main one is a pontiac silver streak just missing indian on the hood. I think the black one may be a Chrysler....and the other a 55/56 Ford ...?